Printed in the 1800's, original engraving (7 1/2"x 10 3/4") by H. Wright Smith. This came from the Herzog and Co. / R.M. Smythe archives when they were relocating their offices in Manhattan. This engraving would look terrific framed. Samuel Francis Du Pont (September 27, 1803 � June 23, 1865) was an American naval officer who achieved the rank of Rear Admiral in the United States Navy, and a member of the prominent Du Pont family; he was the only member of his generation to use a capital D. He served prominently during the Mexican-American War and the Civil War, was superintendent of the United States Naval Academy, and made significant contributions to the modernization of the U.S. Navy. Du Pont was born at Goodstay, his family home in Bergen Point (now Bayonne), New Jersey, the fourth child and second son of Victor Marie du Pont and Gabrielle Jos�phine de la Fite de Pelleport. His uncle was Eleuth�re Ir�n�e du Pont, the founder of E.I. du Pont de Nemours Company, which began as a gunpowder factory and today is a multinational chemical corporation. Du Pont spent his childhood at his father's home, Louviers, across the Brandywine Creek from his uncle's estate and gunpowder factory, Eleutherian Mills, just north of Wilmington, Delaware. He was enrolled at Mount Airy Academy in Germantown, Pennsylvania, at age 9. However, his father was unable to fund his education because of his failing wool mill, and he was encouraged to instead enlist in the U.S. Navy. His family's close connections with President Thomas Jefferson helped secure him an appointment as a midshipman by President James Madison at the age of 12, and he first set sail aboard the 74-gun ship of the line Franklin out of Delaware in December 1815. As there was no naval academy at the time, Du Pont learned mathematics and navigation at sea and became an accomplished navigator by the time he took his next assignment aboard the frigate Constitution in 1821. He then served aboard the frigate Congress in the West Indies and off the coast of Brazil. Though still not yet a commissioned officer, he was promoted to sailing master during his service aboard the 74-gun North Carolina in 1825, which sailed on a mission to display American influence and power in the Mediterranean. Soon after his promotion to Lieutenant in 1826, he was ordered aboard the 12-gun schooner Porpoise, returned home for two years after his father's death in 1827, and then served aboard the 16-gun sloop Ontario in 1829. Despite the short period in which he had been an officer by this time, Du Pont had begun to openly criticize many of his senior officers, whom he believed were incompetent and had only received their commands through political influence. Sophie Madeleine du Pont, in a photograph by Mathew Brady After returning from the Ontario in June 1833, Du Pont married Sophie Madeleine du Pont (1810 � 88), his first cousin as the daughter of his uncle, Eleuth�re Ir�n�e du Pont. As he never kept an officer's journal, his voluminous correspondence with Sophie serves as the main documentation of his operations and observations throughout the rest of his naval career. From 1835 until 1838, he was the Executive Officer of the frigate Constellation and the sloop Warren, commanding both the latter and the schooner Grampus in the Gulf of Mexico. In 1838 he joined the ship Ohio in the Mediterranean until 1841. The following year he was promoted to Commander and set sail for China aboard the brig Perry, but was forced to return home and give up his command because of severe illness. He returned to service in 1845 as commander of the Congress, the flagship of Commodore Robert Stockton, reaching California by way of a cruise of the Hawaiian Islands by the time the Mexican-American War had begun. Du Pont was given command of the sloop Cyane in 1846 and quickly showed his skill as a naval combat commander, taking or destroying thirty enemy ships and clearing the Gulf of California in the process. Du Pont transported Major John Fremont�s troops to San Diego, where they captured the city. Du Pont then continued operations along the Baja coast, including the capture of La Paz, and burnt two enemy gunboats in the harbor of Guaymas under heavy fire. He led the main line of ships that took Mazatl�n on November 11, 1847, and on February 15, 1848, launched an amphibious assault on San Jos� del Cabo that managed to strike three miles (5 km) inland and relieve a besieged squadron, despite heavy resistance. He was given command of the California naval blockade in the last months of the war and, after taking part in further land maneuvers, was ordered home. In 1853, Du Pont was made general superintendent over what is typically considered the first World's Fair in the United States�the Exhibition of the Industry of All Nations, held in New York City. Despite international praise, low attendance caused the venture to go into heavy debt, and Du Pont resigned. 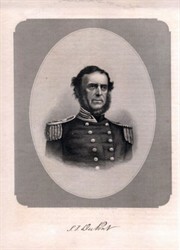 Du Pont was promoted to captain in 1855. In 1857 he was given command of the steam frigate Minnesota and ordered to transport William Reed, the U.S. Minister to China, to his post in Beijing. Du Pont's Minnesota was one of seventeen warships parading Western force in China, and after China failed to satisfy demands for greater access to its ports, he witnessed the capture of Chinese forts on the Peiho River by the French and English on April 28, 1858. He then sailed to Japan, India, and Arabia, finally returning to Boston in May 1859. He played a major role in the receiving of the Japanese ambassador that year, accompanying him on his three-month visit to Washington, Baltimore, and Philadelphia; the trip was a breakthrough for opening Japan to American trade and investment. Du Pont was then made commandant of the Philadelphia Naval Shipyard in 1860. He expected to retire in this post, but the outbreak of the Civil War returned him to active duty. When communication was cut off with Washington at the start of the Civil War, Du Pont took the initiative of sending a fleet to the Chesapeake Bay to protect the landing of Union troops at Annapolis, Maryland. In June 1861 he was made president of a board in Washington formed to develop a plan of naval operations against the Confederacy. He was appointed flag officer serving aboard the steam frigate Wabash as commander of the South Atlantic Blockading Squadron, leading from Norfolk, Virginia the largest fleet ever commanded by an American officer at that time. On November 7, Du Pont led a successful attack on the fortifications at Port Royal harbor in South Carolina. This victory enabled Union naval forces to secure the southern waters of Georgia and the entire eastern coast of Florida, and an effective blockade was established. Du Pont received commendations from U.S. Congress for his brilliant tactical success, and was appointed rear admiral on July 16, 1862. Towards the end of 1862, Du Pont became the first U.S. naval officer to be assigned command over armored "ironclad" ships. Though he commanded them ably in engagements with other ships, they performed poorly in an attack on Fort McAllister, due to their small number of guns and slow rate of fire. Du Pont was then given direct orders from the Navy Department to launch an attack on Charleston, South Carolina which was the site of the first shots fired in the Civil War with the fall of Fort Sumter and the main area in which the Union blockade had been unsuccessful. Though Du Pont believed that Charleston could not be taken without significant land troop support, he nevertheless attacked with nine ironclads on April 7, 1863. Unable to navigate properly in the obstructed channels leading to the harbor, his ships were caught in a blistering crossfire, and he withdrew them before nightfall. Five of his nine ironclads were disabled in the failed attack, and one more subsequently sank. Du Pont died on June 23, 1865, while on a trip to Philadelphia and is buried in the du Pont family cemetery. The cemetery is located near the Hagley Museum in Greenville, Delaware. In 1882, 17 years after Du Pont's death, the U.S. Congress finally moved to recognize his service and commissioned a sculpture of him to be placed in Pacific Circle in Washington. A bronze sculpture of Du Pont by Launt Thompson was dedicated on December 20, 1884, and the traffic circle was renamed Dupont Circle. In attendance were U.S. President Chester A. Arthur and Delaware senator Thomas F. Bayard. Though the circle still bears his name, the statue was moved to Wilmington, Delaware, by the du Pont family in 1920, and replaced by a fountain designed by Daniel Chester French, dedicated in 1921.